The cornea is the transparent, domed front part of the eye that acts to protect the inside of the eye and maintain ocular integrity, while also allowing light to enter for vision. The normal cornea is composed of several layers: An outer layer of epithelial cells lines the surface and protects the rest of the cornea. The thicker, middle layer is called the stroma and contains multiple supportive cells, collagen ﬁbers and nerve ﬁbers. The inner lining is called the endothelial layer and it functions to help keep maintain corneal clarity. A corneal ulcer is a break in the outer epithelial layer of the cornea. Although initially painful, uncomplicated ulcers should heal with appropriate therapy in three to four days. Ulcers that persist beyond this period of time, or progress quickly, prove to be complicated ulcers. 1.Ulcers that fail to heal due to external causes, including ongoing trauma, unresolved foreign bodies embedded within the eyelid or conjunctiva, and abnormally placed eyelashes. 2.Ulcers that fail to heal because they are secondary to other ocular diseases such as dry eye, glaucoma or inï¬‚ammation (uveitis). 3.Ulcers that become deeper or progress due to secondary bacterial or fungal infections. 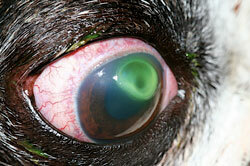 These ulcers may rapidly worsen with resultant perforation of the cornea. They may exhibit a phenomenon known as “melting,” in which the support substance of the stroma is degraded by bacterial or inﬂammatory enzymes and the tissue dramatically softens, weakens and loses its supportive strength and may lead to severe inﬂammation within the eye and result in rupture of the eye with loss of vision. Primary tissue healing defects are conditions in which the epithelium fails to remain adherent to the underlying stroma, even after attempts to heal the superﬁcial ulcer. This condition is common in middle-aged and older dogs, as well as certain breeds, such as the Boxer. It is also found in dogs that have underlying hormonal or metabolic conditions that may delay healing, such as hypothyroidism, diabetes mellitus or cushings syndrome. This type of ulcer is sometimes called a “Boxer” ulcer or an “indolent” ulcer. The basic defect affects the ability of the outer epithelial cells to anchor themselves and remain adherent to the underlying corneal stroma. Although they continually attempt to grow over and cover the ulcer, they are periodically stripped away, either by the eyelids with normal blinking or due to active rubbing of the eye by the animal. Corneal ulcers, including those caused by foreign bodies, can lead to corneal scarring, corneal vascularization and ocular infections that may extend to other internal and/or external areas of the eye (intraocular/extraocular infections). Secondary complications, similar to those for which surgery is necessary, are possible and are discussed in the section titled "Treatment". Evaluating a patient with a complicated corneal ulcer requires several diagnostic procedures, tests and techniques. Among the most important instruments required to evaluate a corneal ulcer is the slit lamp, also called a biomicroscope. The slit lamp permits our veterinary ophthalmologists to carefully evaluate the patient’s cornea with a high degree of magniﬁcation and resolution, equivalent to that of a microscope. Sometimes, a cause for the ulcer, such as an aberrant eyelash or foreign material stuck in the eye, can be identiﬁed. The ulcer will generally heal without complication after removing the inciting cause. To further evaluate a complicated corneal ulcer, we might obtain samples for bacterial culture, virus isolation and cytological evaluation. TREATMENT FOR SCCEDS OR INDOLENT ULCERS. Indolent ulcers do not typically threaten a patientâ€™s sight, however, they may run a protracted course. Medical therapy for indolent ulcers consists of preventative antibiotics and/or hyper-osmotic agents, and offers only a 15 percent success rate. Corneal debridement can be performed with a sterile cotton tipped applicator under topical anesthesia with a 50% chance of healing the focal corneal ulceration. The recommended treatment for indolent ulcers is a surgical procedure called a keratotomy; either a linear grid or punctuate pattern can be used. The purpose of this procedure is to ﬁrst remove all of the loose epithelial cells that are not able to remain attached to the stroma. A very ﬁne needle is then used to make a series of microgrooves, or grids, into the superﬁcial corneal stroma. This will help to disrupt the abnormal portion of the cornea and allow new epithelial cells to anchor down to healthy cornea below this unhealthy zone. This can be performed either awake, under topical anesthesia, or under general anesthesia, depending on the patient and the size of the ulcer. Most indolent ulcers (85%) will heal after this procedure; however, refractory ulcers might require a repeat of the procedure or a more invasive surgical procedure called a superﬁcial keratectomy. In this procedure, the outer layers of the cornea are surgically removed with a specialized corneal blade that peels away the unhealthy layer of the corneal stroma. If a corneal ulcer progresses to the point that it occupies 50 percent or deeper of the corneal thickness, the risk of perforation (which could lead to loss of the eye) is high. These deep or “melting” ulcers require aggressive medical treatment and often will need surgical intervention to salvage the eye. We use various surgical techniques to treat deep corneal ulcers. The surgical techniques we perform most commonly include tissue grafting, such as conjunctival pedicle grafts, corneoconjunctival transpositions, or the application of cyanoacrylate surgical grade tissue adhesive or glue. For the conjunctival pedicle graft, we transplant a piece of conjunctiva (the pink tissue covering the white of the eye) into the corneal defect; we may also add collagen based or biological discs to the graft area in order to increase support and ﬁll the defect. With the corneoconjunctival transposition, we are able to separate a layer of the patient's cornea and slide it into the ulcer defect. The goal of these procedures is to repair the corneal ucler with a healthy piece of ocular tissue, or biological graft material, which we suture into the defect; this allows the graft to become integrated into the corneal tissue during healing. Alternatively, a medical grade of tissue glue or cyanoacrylate may be applied to the ulcer following the careful removal of degenerative or infected tissue. Frequently after the surgical procedure, the eyelids are sutured partially closed with temporary sutures for the initial healing period. This allows the eyelids to act as a supportive patch over the weakened tissue and the delicate graft. It also serves to decreases friction over the graft site and improves comfort for the patient much like a bandage would. Some of these complications can lead to blindness.